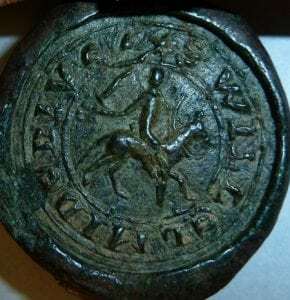 This month’s ‘Image of the month’ features a fine 13th century wax seal depicting an armed knight on horseback which was used to authenticate a conveyance of land in Deddington, Oxfordshire [SGC XV.32.1]. The name of the conveyancer, William de Dive, may be seen impressed in the border encircling the mounted image. 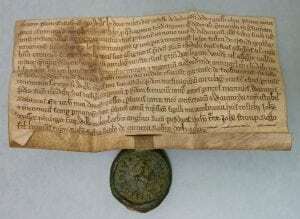 Considering the age of the title deed, which dates from between 1214 and 1261, the seal has survived remarkably intact and is now housed, still attached to its document by a parchment tag, in the St George’s Chapel Archives. Why is it at Windsor? Although the Deddington deed predates the foundation of the College of St George, Windsor Castle, in 1348, it would have been acquired as one of a number of muniments by the Dean and Canons of Windsor on their purchase of one third of Deddington Castle manor from Thomas Dive in the 1360s. Prior to the introduction of a central land registry in the 20thcentury, the possession of a full series of title deeds recording successive land transfers was considered necessary to prove legal ownership. At Windsor, the muniments relating to the College properties were stored in specially constructed wooden drawers in an Aerary (or Treasury), purpose-built in the 1350s for the safe storage of documents, plate and other valuables. The property mentioned in the conveyance consisted of a messuage and croft in the ‘new street’ of Deddington, which were granted by William le Dive [alias de Dive], knight and lord of the Castle of Deddington, to Richard Sibes of Tackley for the consideration of 40 shillings. Sir William de Dive had inherited his lands in Deddington, Oxfordshire, from his father Guy de Dive (d. 1214), who had acquired them on his marriage to Lucy de Chesney. The estate included Deddington Castle, which had been constructed by Odo, Bishop of Bayeaux, in the 11th century and was strengthened in the 12th century, almost certainly by William de Chesney during the ‘Anarchy’, the civil war which took place between King Stephen and Queen Matilda from 1139 to 1154. William de Chesney, one of the principal supporters of King Stephen in Oxfordshire, was defeated near Oxford in 1153 by Henry, duke of Anjou, but on acceding to the throne as Henry II, the king allowed de Chesney to retain at least some of his Oxfordshire estates, his ownership of lands in Deddington being confirmed by a letter patent in 1157. Deddington Castle no longer stands and the Dean and Canons no longer retain their manorial holdings in Deddington, forfeited, along with all their other landed property, to the Ecclesiastical Commissioners in 1867. However, this 13th conveyance, with its delightful seal, is a reminder of the extensive estates which were once owned in over 30 counties of England and Wales by the Dean and Canons of Windsor.